Amazon Price: N/A (as of April 10, 2018 12:01 am – Details). Product prices and availability are accurate as of the date/time indicated and are subject to change. Any price and availability information displayed on the Amazon site at the time of purchase will apply to the purchase of this product. 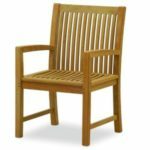 Decorate a tasteful patio with this robust teak arm chair. 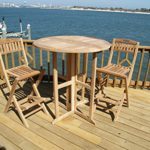 Rich teak craftsmanship satisfies the appetite for both fine taste and lasting quality.The wide slatted back and lightly curved top couple with the warm, unstained teak finish to add beauty and comfort to your outdoor living space. The gently rolling seat and arms offer maximized comfort for relaxing outdoors. Teak naturally weathers over time to a handsome, silvery gray color if kept outdoors; regular application of teak oil will maintain the light brown color of the wood. Simply clean the wood with mild soap and water when necessary.The elegant yet casual form of this chair is perfect for accenting your outdoor or patio area and works well with transitional to contemporary decor. The durable teak wood will provide elegant use for many years.Please note: Our photos are as accurate as possible, but color discrepancies may occur between the product and your monitor. The handcrafted touch of artisan skill also creates variations in color, size, and design; slight differences should be expected. 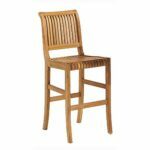 – PRODUCT SPECIFICATIONS: – Brown – Seat: 19.5" W x 17.5" D x 16.75" H – Arm height: 24.75" H; under chair: 5" H – Max weight capacity: 250 lb. – Constructed of 100 teakwood – Ships from Carrollton, TX – Assembly required – 22.75" W x 24" D x 35" H Dimensions:22.75"W x 25"D x 35"H26"W x 38"D x 6"H Some assembly may be required. Please see product details.